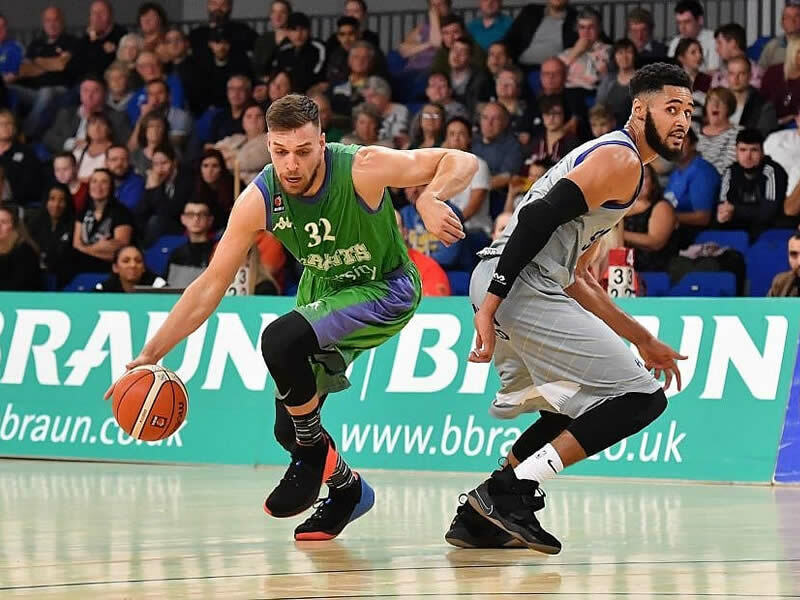 Manchester Giants got off to a winning start in the British Basketball League with a stunning away win at Sheffield Sharks. Debutants Torry Butler (19 points) and Mike McCall Jr (17 points) led the way, and fellow newboy Willie Clayton produced a critical double double (12 points, 11 rebounds) as the Giants won away at Sheffield for the first time since returning to the BBL seven years ago. It also means back-to-back successes over the Sharks, having beaten them towards the end of last season at the Trafford Sportsdome in April. The win came against some adversity, with travel problems meaning the team only arrived 10 minutes before the scheduled tip-off time, meaning the game was delayed by 20 minutes. McCall, Butler and Clayton all started alongside fellow new recruit, Croatian Vlatko Granic, as well as captain Callum Jones, who revelled in his new role. Any doubts over the disrupted arrival were dismissed within two minutes as the Giants raced in to a 6-0 lead, which prompted Sharks coach Atiba Lyons to call an early time out. That settled the hosts and they soon led 10-8, with both McCall and Clayton getting in to early penalty trouble, much to their frustration. Granic landed the Giants’ first three pointer of the evening but an eight point run then put Sheffield in control. A vital James Jones three meant the arrears were 20-16 at the end of the first quarter, mainly thanks to a fine Barry Webster block on the buzzer. The Giants fell as many as 10 points behind in the second quarter, but McCall wrestled them back in to the contest with some great play at both ends, a steal earning him two free shots and then a three pointer, before two brilliant Callum lay-ups tied the game at 37. Sheffield took a four point lead in to half time at 45-41 and the Giants were faced with tactical challenges with Clayton, Bankevics and McCall all sitting on three our four fouls. Clayton was sat down at the start of the second half but was quickly introduced a few minutes in as Sheffield threatened to open up a gap, and then it was up to McCall again with contributions at both ends to keep the Giants within range, before he was forced off shaking his head after picking up a fourth personal foul, coach Danny Byrne opting to keep him available for the later exchanges. Sheffield edged the third quarter to stretch their lead to 70-65 and Dirk Williams started to turn the screw in the fourth. The Giants were clinging on but a big rebound by Clayton and a fine finish by Butler brought them back within one, and they took the lead for the first time since the first half when Clayton’s block enabled a break and James Jones sunk a three to make it 79-77 with just over five minutes on the clock. The lead stretched to five before the Sharks started to claw it back, but time was beginning to run out and the hosts were getting anxious. One from two at the line from Clayton made it 89-85 with just 94 seconds on the clock, before Bankevics’ three-point attempt agonisingly went around the rim and out. McCall kept his nerve for one from two to make it 90-87 and then with the Sharks needing a three to tie the game on the last possession, they penalised for an offensive foul, Butler stepped up and landed two from two to secure a memorable victory. Giants are next in action on Sunday September 30 when we take on London City Royals in our first home game of the season. CLICK HERE to buy tickets online or call 0161 747 2485. Turning point – Having trailed for much of the game, the road team produced a stunning fourth quarter to claim the win – outscoring the hosts by 10 points in the period. Key stat – Manchester found their range from behind the arc, shooting an efficient 46% from three to connect on seven of 15 attempts. Game hero(es) – American duo Torry Butler and Mike McCall produced eye-catching debuts, combining for 36 points on just 25 shots. Meanwhile, Willie Clayton collected a vital double-double (12 points, 11 rebounds) and added four blocks.